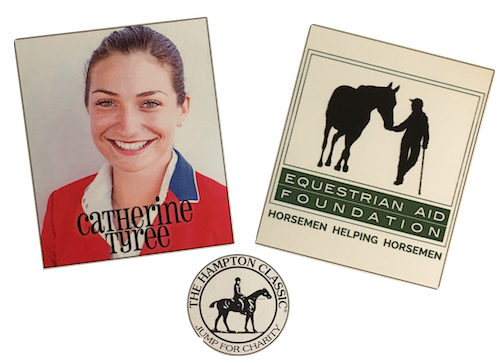 Wellington, Fla. – July 18, 2018 – Equestrian Aid Foundation announced that Catherine Tyree will represent the organization as captain of their team in the Jump for Charity presented by Sea Shore Stables. The event takes place during the $75,000 Douglas Elliman Grand Prix Qualifier at the 43rd annual Hampton Classic Horse Show, Friday, Aug. 31. The Jump for Charity is an exciting way for spectators to enjoy a world-class show jumping event that features an opportunity to raise funds for a worthy cause. The format for the event includes 10 charities paired randomly with 10 international FEI riders, who will serve as team captains. Hampton Classic Executive Director Shanette Cohen drew Tyree as the team captain for Equestrian Aid Foundation during a live drawing on the Hampton Classic’s social media platforms. Funds will be raised for Jump for Charity through the sale of caps uniquely designed for each charity/rider team. The caps will feature the Hampton Classic logo, the charity name, and the team captain's autograph. Additional Jump for Charity caps without specific charity names are also available for purchase. The caps sell for $50 each and may be pre-purchased on the Hampton Classic website or on-site at the Hampton Classic, while supplies last. Those who pick up their hats at the show will have the opportunity to have their hats autographed during special sessions Thursday and Friday on the showgrounds. As an exciting addition to the Jump for Charity this year, event organizers will raffle off the chance to win a course walk with a Grand Prix rider. Each Jump for Charity hat purchased before Friday, August 31 provides one drawing entry, and additional chances may be purchased as well. All proceeds from the sale of the caps will be distributed as follows: $1,000 to the third-place charity, $2,000 to the second-place charity and the remaining funds to the charity of the highest-placed rider. Last year, a win by Daniel Bluman earned $12,000 for Michael J. Fox Foundation for Parkinson's Research. Other participating riders include Georgina Bloomberg, Daniel Bluman, Beezie Madden, Callan Solem, Adrienne Sternlicht, Shane Sweetnam, Jimmy Torano, McLain Ward and Andrew Welles. For more information about the Hampton Classic Horse Show, please visit the Hampton Classic website at www.hamptonclassic.com or call (631) 537-3177. Hampton Classic Horse Show, Inc. is a 501(c)(3) charitable corporation.